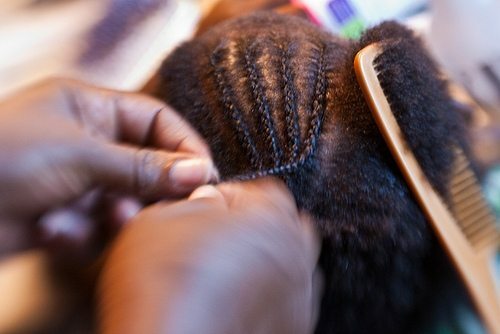 In a win for fairness and common sense, the state of Oregon will no longer subject people who practice African-style hair braiding (and other forms of natural hair care) to a bizarrely burdensome licensing process that’s more lengthy than what’s required for someone to fight fires or give lifesaving medical care in ambulances. As Sightline first highlighted in our Making Sustainability Legal series, Oregon state law previously required anyone who wished to braid, cornrow, twist, lace, wrap, or weave extensions or decorative elements into hair to undergo 1500 hours of cosmetology coursework and training (compared to 130 hours to become an Emergency Medical Technician and a minimum of 385 hours to become a firefighter in some states). This was particularly unhelpful since natural hair care practitioners don’t cut, color, perm, or straighten hair, the basic skills taught in cosmetology school. The regulations were arguably racist, since they prevented hair braiders—most of whom are African immigrants or African-American women—from earning a living without undergoing largely irrelevant training that can cost up to $17,000. Last week HB3409B, otherwise known as the Natural Hair Care Act, cleared its final hurdle in the Oregon Legislature. The bill defines natural hair care separately from barbering and hair design and lays the groundwork to create a less onerous licensing process—yet one that still requires practitioners to have basic health and safety knowledge. Starks, 31, decided to start her own business this year. She volunteers as a surrogate big sister to girls in foster care, and she’s seen young black women struggle with both their hair and questions about their identity. Braiding, a baby step toward chemical-free styles, seemed an obvious path to make some money and do good. She sees herself as a sort of follicular Johnny Appleseed, teaching small-town black kids and white parents of adopted children how to handle African hair. Department of Human Services regulators liked the concept but suggested she check with the state cosmetology board. That’s when she discovered that she needed a cosmetology license to braid in Oregon—even to do the work for free. Starks brought her catch-22 to lawmakers attention, explained how current regulations criminalize an important aspect of black culture, and tirelessly championed the natural hair care bill sponsored by Portland Democrats Sen. Jackie Dingfelder and Rep. Alissa Keny–Guyer. She had a righteous and nearly unassailable argument on her side, and, fortunately in this case, common sense prevailed in Salem. Let’s hope that Starks will soon be able to move her business from Vancouver, WA, where touching hair without a cosmetology diploma is not a criminal act, to a more welcoming business climate in Oregon. Previous articleKanye West New Album 2013, Alternative ‘Yeezus’ Album Cover Goes Viral [PHOTO]: TOO Controversial?